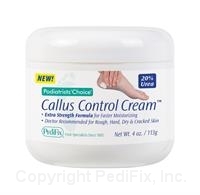 20% Urea to Soften & Moisturize Rough, Dry Skin. Hydrate and exfoliate in one step with this extrastrength formula. Urea penetrates calluses and thick, hard skin to produce soft, smooth feet that look and feel healthy. 4 oz. jar. Sold by the jar.